It’s an overcast Monday morning and I am on my way to meet fashionista and budding entrepreneur, Jacynth Bassett, at Peyton and Byrne café to discuss her online fashion boutique for women over 40. She suggested that we met at this pretty little café in Greenwich: with its disparate décor and homely ambience, it was a great place for our interview. I managed to bag us a square table by the doorway of Peyton and Byrne, away from the mid-morning rush of caffeine drinkers, who frantically ordered their double-shot espressos at the barista counter. Jacynth burst through the door a few moments later, greeting me with an excitable smile. She wore a fitted, pin-striped cashmere sweater from her online boutique, embellished with a statement pink and yellow star on each cuff. Jacynth Bassett is the founder and CEO of The-Bias-Cut: a timeless online fashion boutique offering a range of premium, contemporary fashion for women over 40. She launched her online boutique on the back of her mother’s frustration towards the amount of monotonous and unflattering clothing lines, that were offered to women of her age. Jacynth’s online fashion venture was created to provide her mother- and other women like her- with timeless, stylish and good-quality garments that gave her the opportunity to feel confident and to embrace her body. After all, fashion is a personal affair and it is important for women to feel confident in their appearance. Desperate to find contemporary labels that celebrate female individuality and promote the modern elegance of fashion, Jacynth has collaborated with inspiring design brands such as House of Spring, Gibson Birkbeck, Jessica Russell Flint and many other emerging fashion designers, to provide her customers with classic pieces that ooze beauty, quality and most importantly, allow women to express their individuality. She believes that her online boutique empowers women of different ages, shapes and sizes to celebrate themselves, and to express uniqueness and independence. The young entrepreneur is continuously on the look-out for new designers to collaborate with, that will empower her customers to feel confident in what they wear. I studied law at Cambridge. After realising a career in law wasn’t for me, and that I wanted to go into business instead, I decided I wanted to do something that I really loved and cared about – and fashion was the obvious answer. I had a lot of self-taught knowledge of the industry, and had been obsessed with it from a very young age. But I also knew the fashion industry is a heavily saturated market, so I needed to find a niche. Quite quickly I thought about my mum – a woman who loves style and wants to look good, but had begun to feel invisible in the eyes of the fashion industry largely due to her age and shape. She felt all the styles offered to her age group were frumpy, dowdy or boring, and struggled to find the right pieces. So that’s when I had the idea for the-Bias-Cut.com. I tailored the rest of my law degree modules to business and, as soon as I graduated, I began to research, develop and build the business concept. I started with a blog in July 2015 to test the waters and grow a following. In March 2016 I finally launched the online boutique, funding it through money earnt from doing legal drafting, and insurance money after my suitcase- with all my belongings in it-got stolen off a train! With the support of interns, I’ve run the business to date alone, and we already have an international customer base, 20 labels, a forum with 2000 members, and are continuingly growing. 2. What does your brand aim to offer to customers? The-Bias-Cut.com is the first online fashion boutique that truly celebrates style at every age. We curate collections featuring pieces by some of today’s best contemporary labels, but always take into consideration women over 40, rather than treating them as invisible or irrelevant as most retailers do. So whilst we sell pieces that look fabulously stylish on women of all ages- and indeed are often featured in the likes of Vogue- we only select the ones that will also work on women’s changings body shapes and lifestyles, and allow them to express their own sense of style and individuality. Essentially, it is my mission to prove that every woman can and deserves to look stylish, and to cut through ageism in fashion once and for all. The-Bias-cut.com is the product of that. 3. What is the main concern for The- Bias-Cut customer? Confidence is the main issue. I have a very unique stock strategy in that our customers are divided into four confidence levels. I make sure that I have enough products that tick boxes in all of these levels; it’s about encouraging them to step up to another level. We can work out the customers profile based on that and see what we can push them to try next. It just means as well that when I work out next seasons stock, I can be like we have got a few ‘out there’ pieces, but we’ve also got pieces that will work for the woman who’s a little more reserved. Confidence is the main issue the other one is the fit. We’ve got a very very low return rate because of using real female models so that customers can see that it’s going to fit them. Their main concern is “is this going to fit me?” Once they know the brand they are generally quite able. Our core customer is quite exciting and it’s really nice how our main customers are just excited to try new things and look a bit different. We are all about embracing your body. Our customers know that they can come to us. Everything has got something slightly different about it, even if it’s a simple jacket. 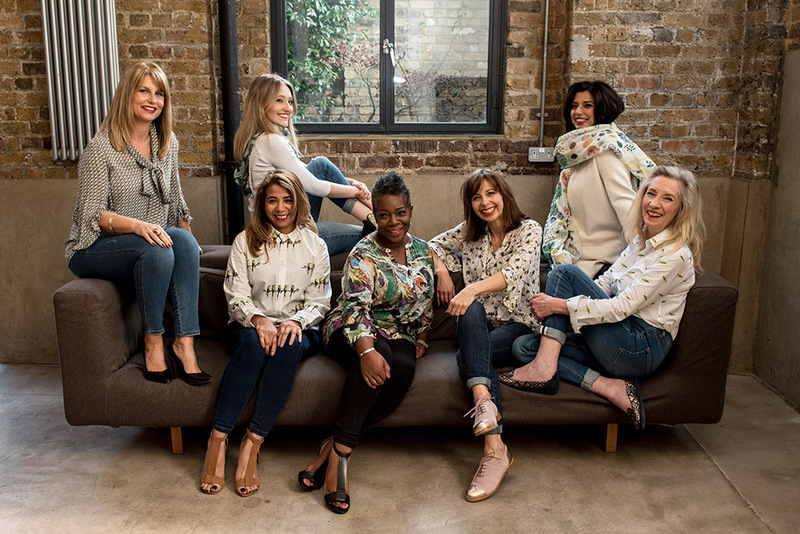 Our customers are of all ages, but because we want to offer an empowering shopping experience for women over 40, we only use real women models aged 40+ of different shapes, ages and sizes. And we have tailored filters, such as being able to shop by your shape, size, areas you want to show off, and areas you want to cover. So we’re really putting this customer first. Our aesthetic and the time we also put into curating our collections is very important. Everything has to be of excellent quality, a flattering cut, and a modern style with a timeless element. We aren’t interested in fast disposable fashion, nor are we going to sell simple, basic pieces you can easily buy elsewhere. We know that all women are different and have different confidence levels, so we make sure we cater to this by offering pieces that are different cuts, shapes and aesthetics – whilst still being contemporary and elegant with an interesting twist. Plus we want to encourage our customers to be individual, so we only sell cool, independent brands – a mixture of relatively known and unknown – because our discerning woman doesn’t want to see ten other people wearing the same thing! We have an active blog with featured guest writers, and an online forum called ‘Ageism Is Never In Style’ that connects women around the world, and offers them inspiration and advice. We offer very personal sizing advice and customer service. I’ve also found the fact that I’m only 24-years-old is something that our customers really love, and make us stand out from the crowd. They appreciate that I was inspired by my mum and respect my rule that if I don’t like an item of clothing and wouldn’t be willing to wear it, why should my customer? We have an objective eye when curating our collections, which our customers really trust. 5. What do you look for in new brands when stocking for new season? The aesthetic has got to be modern and contemporary, but it’s also got to have a timeless element to it so that it won’t date. You can mix and match and find what you want, but also express yourself in your own way. I spend a long time making sure that the looks would go together: I have spreadsheets where pieces are paired with other things. I might see something by a brand that I like, but if it doesn’t go with other things in the collection, then it’s not coming in. It might be of a nice quality but if you can buy a cheaper version, in say M&S, it’s not going to be on the website. I just think it’s different if it’s in a shop; you can feel it and try it on, but it’s hard to understand the quality online. I just know if it fits brand identity. To see the latest products and collection, please visit The-Bias-Cut website. Fashion boutique for women over 40 comes to Greenwich! From Thursday 25th – Monday 31st May, they’ll be at 7a Greenwich Market, London (nearest station – Cutty Sark DLR). You’ll be able to meet the team, browse, try on and shop! Credits: Written by Sophie Parrot.